Once again I am behind in making the great announcements and keeping any readers I may have left aware of what is happening in our lives. I apologize for the delay, but my youngest has been wanting to share something for a couple weeks. In fact, she shared weeks ago on my wife’s blog and on my son’s blog. 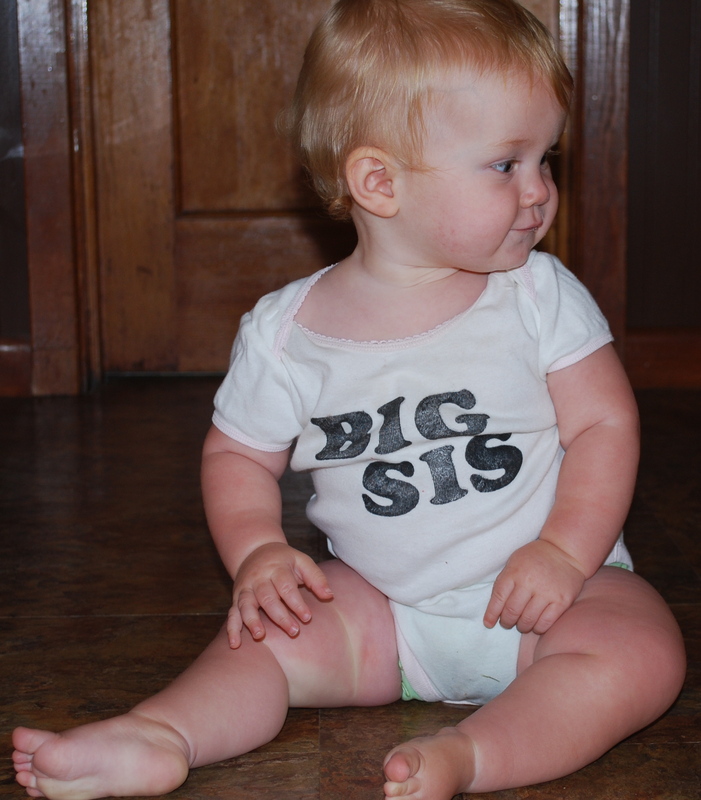 Okay, if you don’t have it yet (or even if you do), Abby is a big sister to a baby that is developing inside Gina. 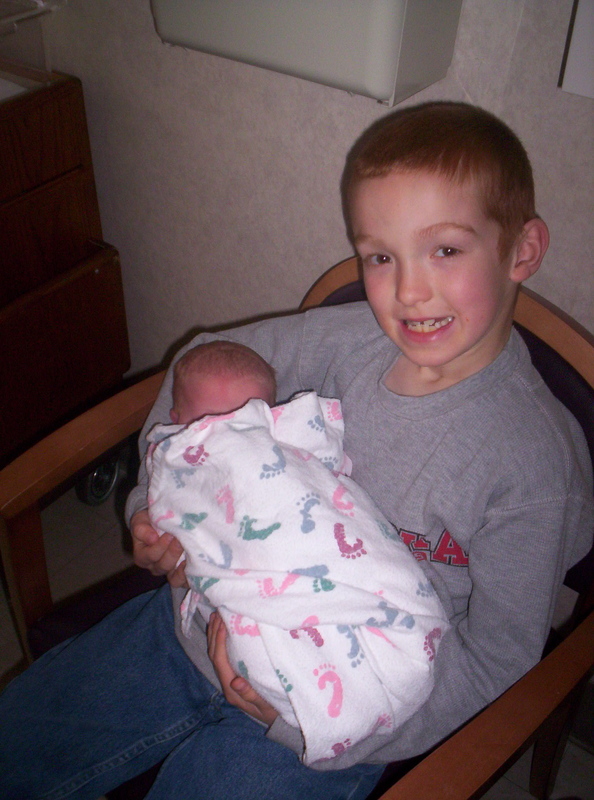 We hope to all meet Abby’s younger sibling in late June 2009! Stay tuned for more late updates. The only truly American holiday, and I have much to be thankful for and many to whom I want to publicly express my thanks. There is obviously much that has happened in the last year of our life. We bought our pastureland last December and we bought our home in March. God has graciously led us out of the desert and into His bounty. But most recently and most on my mind of late is the tremendous outpouring of blessings we have experienced in relation to the birth of Abigail Ruth. I am thankful to God for his calling us to continue to grow our family. In the past we acted selfishly and decided we didn’t want more children because we wanted to be able to enjoy a measure of prosperity and get the kids out of our home. Incidentally, I am not saying that all folks who don’t want more children are being selfish; I am merely accusing myself of being selfish in my motives. I am thankful to God for allowing and orchestrating all the following thanks that, in coordination, led to our blessing. In addition to the thanks I am about to express, I don’t doubt that there are many more that I should be thanking, but I have neglected to thank them either out of ignorance or forgetfulness. 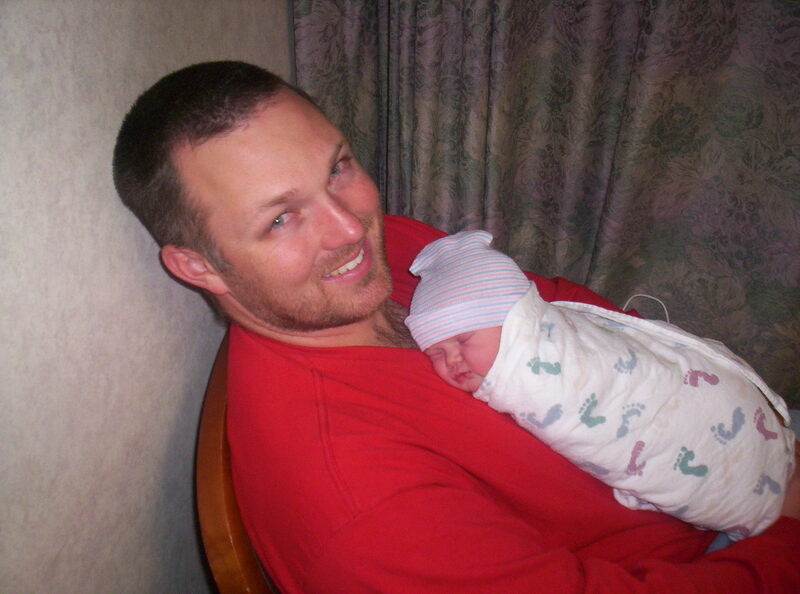 I am thankful to Dr. Cary L. Leverett in New Braunfels, TX, whom we visited last October for a vasectomy reversal. He was a caring professional who, through God’s richness, has returned to us the ability to make babies. I am thankful to the midwives in Arizona who would have legally assisted us in our childbirth if we had stayed in Arizona just a few months more. I am thankful to our midwife and her assistant here in Nebraska for their competent care. I know that they are disappointed that the homebirth didn’t happen, but they did precisely what we wanted them to do. They assessed the situation and gave professional and competent advice, which we followed. They were very caring and we would not have wanted to labor with another team. I am thankful to our wonderful neighbors to the South once again, for their continuous unflagging support. Mother and oldest daughter came to our house during the labor and mother stayed with Gina while oldest daughter stayed with Caleb and kept him occupied. When we realized we would have to transfer to a hospital, they unhesitatingly undertook the task of watching our children for us. I am thankful to my two older, dear children, Caleb & Meagan, for their support throughout the pregnancy. 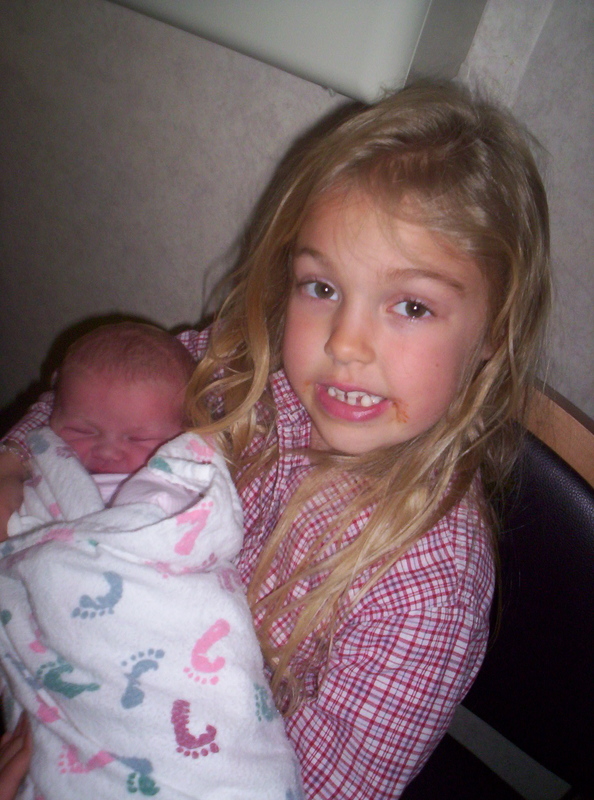 I am especially thankful to Meagan for her desire to be there throughout all stages of the birth. 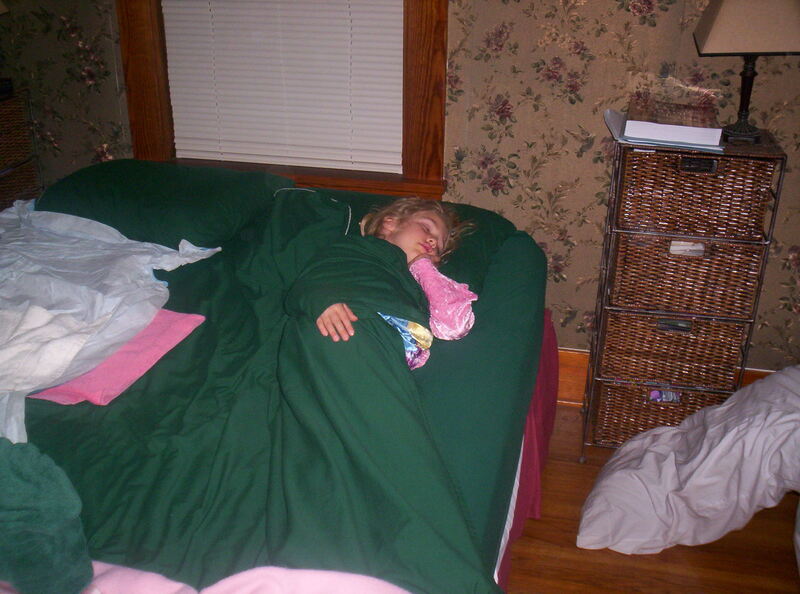 Of course, she is just six, and she had some trouble staying awake, as evidenced by the following photograph of her during the labor process. 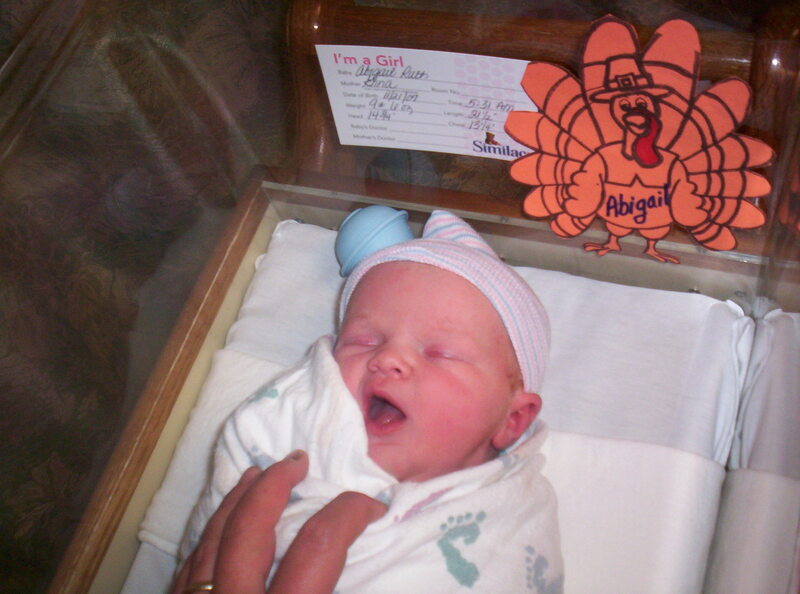 My greatest disappointment is that she was not able to accompany us to the hospital to be present for Abigail’s birth. She is precious. I am thankful to Dr. Brian Finley and the entire team at the University of Nebraska Medical Center in Omaha for their exceptional care for Gina during her hospital stay. Dr. Finley was a caring professional who shed his own tears when he told us that our only option was an emergency caesarian section. His care for us throughout was filled with sympathy and he allowed us to leave the hospital on Thursday evening, even though ‘normally’ a mother would not have left until Saturday morning. We did not want to continue to recover in the hospital. We wanted recovery to occur at home, where Gina could be cared for in a comfortable environment with the whole family around her. I am thankful to Gina’s Uncle Rick & Aunt Mary for watching our children during our second night away from home. I am thankful to Gina’s dad, Dale, for his awesome support throughout our hospital stay in shuttling the kids around and taking care of our every need. I am thankful to Dale (again), Carol, Kelli, Terry, Tate, Kaia, and Eliot for visiting Gina & Abby in the hospital. It was a sacrifice for them that demonstrated their love for us. I am thankful to Rod & Caleb for giving Abby her first dollar. I am thankful to our neighbors (again) and Kelli (again) for providing meals and assistance in caring for Gina after we returned home. Here she is: the new princess in our house! She is just so beautiful and wonderful! The obligatory pic of baby sleeping on Daddy’s chest. 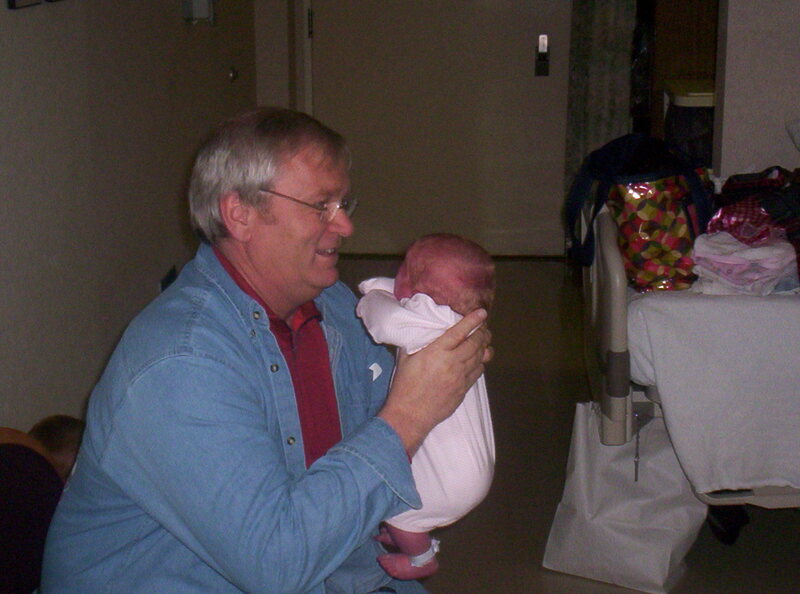 Grandpa and his third grandchild!